Our archive exclusively contains aerial photography taken in excellent visual and meteorological conditions made on professional cameras, films and sizes. Optimum conditions exist on no more than 15 days per year. This makes aerial photograpy a task requiring precise planning and procedures. 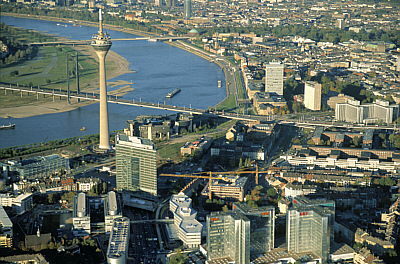 The specialized subject of our archive is Northrhine-Westfalia (NRW), the Rhine-Ruhr-Region and the cities of this region. Aspekts of structural and historical development, economy, industry, urban and rural landscape, buildings and places of interest can best be visualized from the aerial perspective. Our photographs have often become an important element of publications ranging from marketing to scietific purposes. On your request by phone or via internet we can pesent suggestions for your publication. Just give us a description of your topic and the required motive. We will search our database to find suitable photographs. If you need a special view of a motive in our region not available in our archive, we will arrange a new photograph according to your requirements. The new photographic task will be planned and flown as soon as weather conditions are suitable. Our activities in aerial photography specialize on "urban and rural development in historical/contemporary contrast" (see publication). If you need a precise analogy of a specific historical aerial motive we do the research and retrospective survey and will take a high quality new photograph.